When I was six years old I had the run of my yard to play in, my house being built on then five acres of untouched desert in Apache Junction, Arizona. At the time Apache Junction was still a small town, and it hadn’t been absorbed into the sprawl that now stretches from Phoenix to base of the Superstition mountains. My childhood plans at the age of six changed from day to day, whether it was climbing the mesquite trees surrounding my house, digging holes, or running around my mother’s expansive garden pulling up weeds as she worked on the more delicate pruning and care of her plants. The sun was shining warmly outside, as it does almost all the time in Arizona, therefore I was dressed in a blue short sleeve shirt and tan shorts. On this particular day, I noticed these beautiful purple blossoms newly opened on some of the prickly pear cactus’s within my yard, and I decided that I would pick a bunch of them to take into the house. This was a normal habit of mine that saw the entrance of random sticks, wildflowers and seeds to add to my collection of natural things. This was encouraged by my mother, a woman whose boots and hands were always covered in tiny pieces of earth from when she worked in the garden or on one of the many agricultural projects with which she was involved. She accepted and even encouraged my love of nature and the entrance of various bits of nature into our home. The one time she did bar my entry was when I had found a freshly severed rabbits foot into the yard, telling me that it would probably be best to leave it outside till the gore had at least dried. My excitement now peaked by these intriguing flowers, I waded into the swathes of prickly pear, brushing past the thick stalks to where my short reach allowed me to pick the flowers. I started picking them, not noticing the covering of hairlike bristles around the bases of the flowers and on the pads themselves. 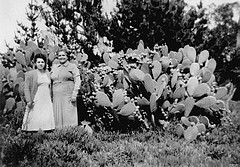 My mother of course came out of the house eventually in order to check that I wasn’t doing anything too destructive, having discovered me the previous week dissembling my grandmother’s radio on the front porch, and after seeing me amid one of the swathes of prickly pears that made their home on our piece of desert, she promptly shooed me away from the plants. She shouted at me “Patrick, get away from those!”My task now disrupted by my mothers scolding, I noticed the prickly feeling of all those spines now working their way into my skin as I ran out of the patch. My mother, seeing my growing discomfort edging towards what would turn quickly into tears, immediately stopped her scolding and took me inside to get de-prickled. It took maybe two hours to get out most of them, but for a week later I would from time to time feel a twinge or prickle whenever a spine that had been missed decided to show itself. As she de-prickled, she lectured me on how I needed to be careful and that she had warned me before not to go into the prickly pears, but all I did was tearfully nod as she pulled spine after spine out of my flesh. After this episode, I hated the prickly pear and stayed as far away from them as a I could since this was, at the time, the most pain I had ever felt. Looking back on this episode in my life, I find it interesting that the first knowledge I had of the prickly pear wasn’t a piece of information gleaned from a book or from the lecture of a school teacher, it came strangely instead in the form of a warning from my mother when I was very very young before I managed to get myself covered in spines. My mother had told me in her most commanding parental tone when I was still almost a baby, that I should stay away from the prickly pears because they could hurt me, and for many years I did just that until the events I just mentioned. My mother knew more about plants than anyone I have ever met, she had been on the path to getting an agricultural degree when she promptly left college to travel around South America as an artist. Even though my mother possessed no formal degree, she substituted what college she had with the hundreds of books she read on the topic, while also keeping a large personal library of her favorite texts. On our land my mother had a large greenhouse, shaped like half a cylinder that was sunk into the ground, where she cultivated both native plants and more delicate vegetables and herbs year round, endlessly observing their life cycles and caring for them. In addition, there was an extensive garden fenced in by chicken wire to keep out some of the desert critters, yet somehow the rabbits and ground squirrels found their way in to eat the delicate plants every year. Even though they did, my mother was more impressed than she was annoyed at this fact since she enjoined all the life that could be observed in our patch of desert. I can still remember the hollyhocks and sunflowers that my mother would grow every year that bordered the garden, looming over me when I was small. Everyday after dinner my mom, grandparents and I would pass by the greenhouse and garden, strolling through the desert on a evening walk in the coolest part of the day. The ritual of the household since before I was born was to take an evening walk, perhaps hearkening back to a different age when promenading along the streets and looking into shop windows was undertaken on a regular basis, but in this case there were no streets or shops. The streets were the natural paths through the desert and the shop windows were the panorama of the evening lighted sky. Every evening my mother would dress me and put me in my stroller, sometimes with a blanket if the night air was chilly, and then my mother and her parents would walk while I was pushed through the desert. I would stare at the desert trees, bushes, prickly pear, and everything as my grandparents and my mother spoke about their days and the goings on in the world while I enjoyed the ride, usually falling asleep before we returned to our home, a little island of light in that seemingly endless desert of my youth. On days when my grandparents were absent, she would walk with me alone and talk to me, not as some mothers do in meaningless sounds such as coo’s and awes, but in long waxing sentences that spoke about the plants around us, sometimes in great detail as in the scientific names of all the plants in our yard such as the velvet mesquite Prosopis velutina , and at others about the native people’s uses for different plant such as the Agave which was used as a sweetener and for fermentation into alcohol. My mother seemed to know everything about any plant I asked about, and she seeing my enthusiasm fed my desire to learn with interesting tidbits about the natural world on a daily basis. Among all those plants she described such as the Palo Verdes, the oily Creosote bushes, the barbed Ocotillo, the stately Saguaro’s, the squat Barrel cacti, the soothing Alo Vera and the thorny Mesquite, there also appeared the strangest looking plant for my young eyes, the prickly pear. Unlike the other major designations of plants within the desert, prickly pears aren’t trees, bushes, vines, or anything else for that matter. They are simply fleshy pads covered with spines, that in my mind at that age looked more like the paddle from my paddle-ball toy than any sort of plant. It was in part the sheer varieties that captured my attention as a child. I remember my mother naming all the varieties of the prickly pear in my yard, Opuntia Basilaris or Beavertail prickly pear close to the ground bloomed with purple flowers , called Tuna, and others such as Pancake prickly pear, Opuntia Chlorotica, towering from my perspective at heights of around seven feet, almost treelike other than the obvious cactus flesh. There were too many names to remember of all the varieties my mother knew in my patch of desert. Where normally things in my childhood world would have only one name attached to them , such as the honey mesquite tree, Prosopis glandulosa, in which my grandfather had built me a tree house where I would play for hours in my own imaginary worlds, the names of prickly pears did not fit into the vocabulary of my universe, being too varied for my mind to really grasp. Even then, they captured my childlike attention, and but for my mother’s proffered warning, I might have encountered trouble with them the very moment I saw them while being pushed through the desert as a child and not years later. 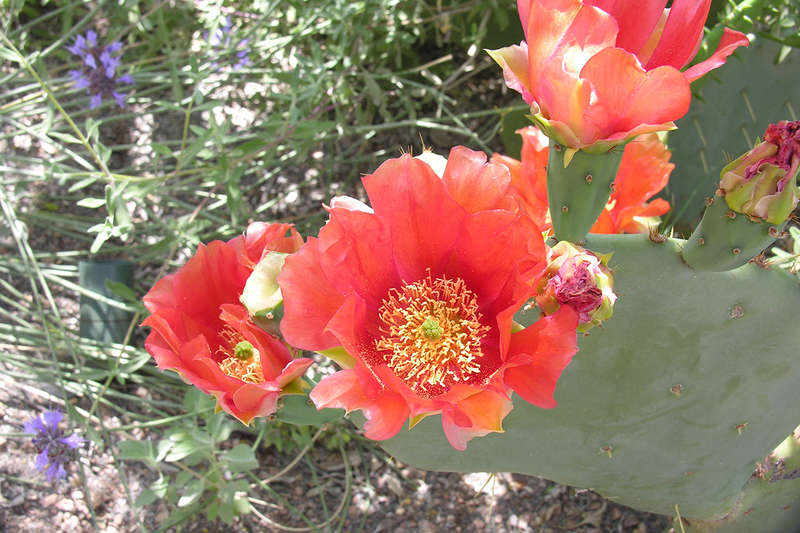 The prickly pear cactus blossoms from early spring and into the summer months. The flowers of the prickly pear are large and showy. The blooms can be red, yellow, orange, pink, purple, or even white. 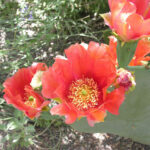 “Some opuntia flowers emit a fragrance of damp earth; perhaps the smell resembles “home”to the ground-nesting bees. Mature fruit ranges from tan or green and dry to bright red or purple with juicy pulp; all contain large, very hard seeds”(“Pricklypear as Resource”, n.p). Eventually these blooms die and the fruit emerges, yet the problem I encountered when I was six was that the flowers bases are also covered with small spines. The spines don’t feel like much at first, but as they work their way into your skin, especially between your fingers or toes, they begin to prickle and sting. You can’t even see them if they have worked their way in enough as I discovered in my boyish desire to pick those flowers so long ago. 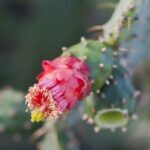 Most people have experiences such as these concerning the prickly pear, whether encountered on a hiking trip, accidentally brushing up against one while walking around your yard, or even just thinking about those cactus spines digging into one’s skin. 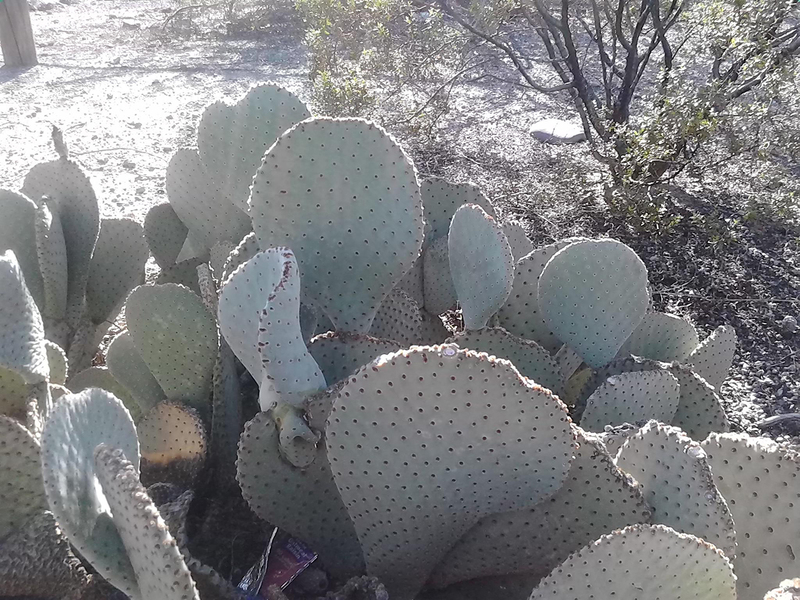 Many people view them as an annoyance that should be eradicated, but there is more to the prickly pear than just the fine spines that cover the pads. First, it is important to note that the name prickly pear has been given to over twelve varieties of cactus within the Southwest (“Desert USA”, n.p.). They are originally native to the Americas, but since then they have been spread across the globe through their own reproductive abilities and humanity’s help. They are members of the Cactaceae family and genus Opuntia, the same genus is shared by the Cholla cactus varieties, with their range stretching from Canada to southern South America. These cacti are characterized by the large fleshy paddle shaped leaves that they possess, though their name actually derives from the pear shaped fruit that grows on the end of the pads, also known by the name Tuna or Indian Fig. These fruits are covered with tiny spines called glochids, making the fruit prickly. These pads are actually the stem of the plant and can reach sizes of four to 18 inches in length, and up to as much as nine inches in width. The glochids on the pads, unlike larger cactus spines, resemble very fine hairs and are barbed (Hart and Lyons). The barbs easily cause irritation to the skin and can be very difficult to remove, my experience as a young boy attested to this uncomfortable fact as the spines were tweezed out of my arms and legs. In addition, they have secondary longer spines which are similar to other cacti, though certain spineless varieties have been produced by humans, though they are generally less successful since the spines would normally provide protection from animals that might try to eat or disturb the plant. 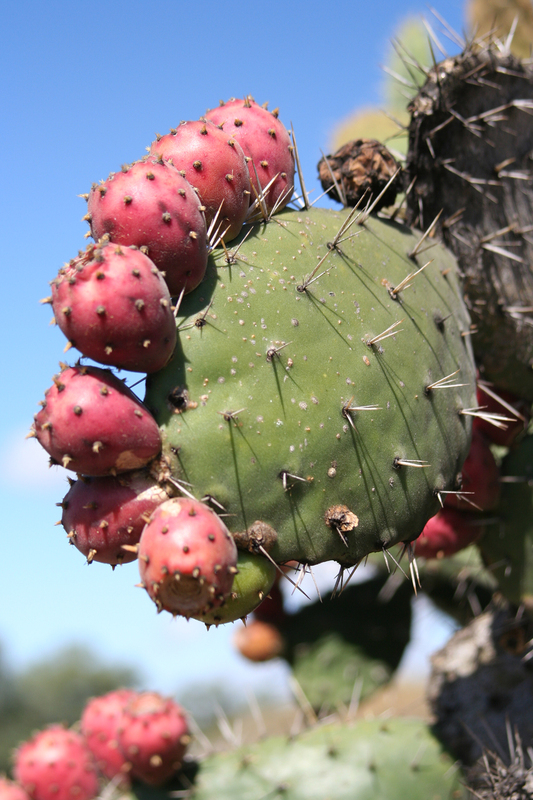 Even though it can be said that all prickly pears possess some of the same basic characteristics, identifying specifically what variety of prickly pear one encounters can be very difficult. 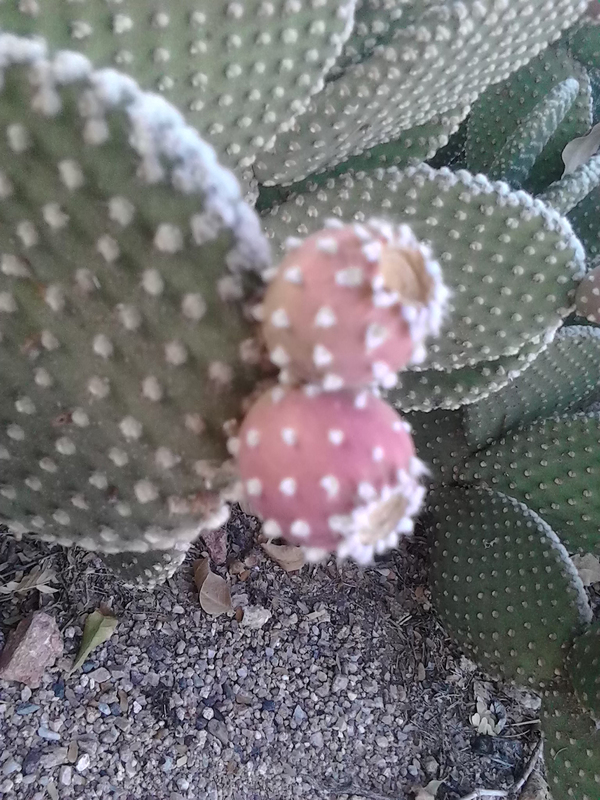 The white dots on the fruit are known as glochids. An example of some of the larger pads. Narrowing down exactly what species a prickly pear belongs to can be a test of one’s mental acuity, primarily due to their ability to adapt to different environments quickly. Prickly pears are very adaptable to their environment since they have two ways of reproduction, which exponentially increases their genetic diversity. The first method, which most people are already familiar with, is through the spreading of seeds, primarily by animals who eat the fruit. These fruits are fed upon by many species within the desert such as small rodents, birds, javalinas, and deer. More interesting is the second reproductive method, which involves the parent plant essentially creating a clone of itself. If a pad from the parent plant is severed, this pad can put out roots and create a new plant that is entirely identical to the parent plant, which is also one of the reasons that it is very simple for a person to plant a prickly pear in their yard(Hart and Lyons ). The ability of the plant to do this makes it possible for a plant to survive even if the plant has been chopped up by machinery or disturbed by animals. Over time the stronger plants best suited to the environment will survive, and when given enough time other variations can be created through cross pollination. It is also very common that a prickly pear can cross pollinate with one of its offspring to create a true hybrid version, which only further muddles the species. As time progresses gradual changes occur in size, flower color, fruit color, the size of spines, number of spines and pad color, but all are still at their most basic level prickly pear cacti. The variations in prickly pear have further been aided by the helping hands of humans who have since transported varieties of prickly pear cactus across the world since their discovery in the Americas. The earliest recorded description in literature is found in “The Journey of Alvar Nuñez Cabeza De Vaca And His Companions From Florida to the Pacific”. Cabeza De Vaca was a 16th century Spanish explorer, who noted the proliferation of prickly used in Native American culture during his travels. Cabeza De Vaca’s encounter with prickly pear happened after he and his remaining crew were captured by an Indian tribe on The Isle of Misfortune and forced into slavery, one of this tribes main staples was the fruit of the prickly pear. Eventually Cabeza De Vaca was able to escape to the mainland, and after years living among friendlier natives he arrived with his story back in Spain preserved in his journal. However, prickly pear had already been in wide spread cultivation and use within the ancient Aztec civilization before Cabeza De Vaca noted it in his journals. The Aztecs had discovered the use of the cochineal bugs, that live on prickly pear, as a source of red dye with which they used to dye the robes of the emperors such as Montezuma II. When Cortes encountered the Aztecs, he quickly sent back word about the discovery of cochineal, in addition to some cloth to Charles the V. Charles later ordered Cortes to determine “whether it was present in exportable, and to ’cause as much as possible to be collected with diligence’”(Lee 454) and so the desire for cochineal dyed cloth was ignited. Previously, the ability to dye cloth crimson was incredibly difficult, and cochineal provided a way for it to be done that was worth a fortune. When Spain began mounting incursions into the New World, they not only found and plundered the silver that they were initially after, but also the secret of the cochineal dye. “The brilliant scarlet, crimson, and purples hues derived from the cochineal eliminated all the competitors from the dye market…by the close of the first century of Spanish rule in Mexico, grana had become a symbol for brilliant, fast colors, Mexican wealth, and a tightly-guarded Spanish monopoly”(Lee 450). This newly acquired dye became one of the primary imports from the new world, whose industry would last till the 1800s when synthetic dyes would come into production. The white clumps on the pads are cochinael. This Cochineal insect, its scientific name being Dactylopius coccus, makes its living on the prickly pear cactus with the female of the species producing the characteristic red dye. After the Spanish Conquest, one of the main imports from the New World was the cochineal bugs, which were used to dye the robes of royalty and the very rich. The trade ships that went between Spain and the new world valued cochineal almost as much they did gold. 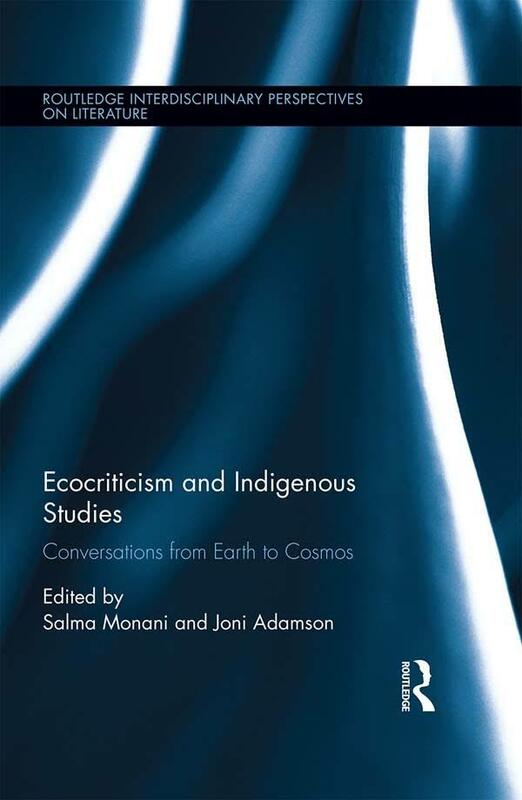 One tale speaks of the young poet John Donne, who signed onto an expedition against Spain as a privateer, with the earl of Essex at the age of twenty five, who returned with a fortune in cochineal plundered from Spanish ships. Even if this story about the plunder of cochineal is merely a myth, cochineal did make its way into Donne’s poetry. At this time in history, Spain and Britain were constantly at war since they were the two main powerful nations vying for control of the sea’s and the New World. Part of this is linked directly with the commerce going on at the time, with trade ships from the new world carrying untold riches. Some of these were cochineal, which in a few cases must have been raided by English Privateers. Many people tried to discover a way to produce cochineal in other areas of the world, but most fell prey to the fact that the cochineal insects couldn’t survive in extreme climates and the nopal cactus where they laid their eggs didn’t take very well to moist or cold climates, instead preferring hotter and dryer extremes. The cochineal insects inability to survive without the prickly pear cactus speaks to the inter-reliance of species upon one another. As people began to try to adapt cochineal production to other climates, they realized that they needed both the cactus and the insect to prosper in order to produce the dyes they wanted, especially since it requires about 70,000 insects to make a single pound of dye. 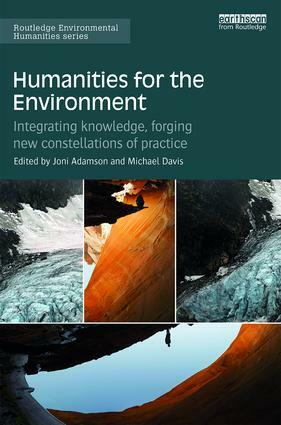 The inter-reliance of species is a topic which is important more so today than ever due to the massive losses the earth is experiencing in biodiversity. Something as small as one species disappearing can have cascading effects upon others, just as the farmers who wished to produce cochineal dye found when their nopal cactus couldn’t survive and their dreams of riches based on cochineal dye faded away. I first encountered the cochineal bugs when my sixth grade elementary class visited a working vegetable farm in the heart of Tempe, there the students were shown how to harvest the cochineal bugs, seen in the picture above as the white substance on the pad of the prickly pear cactus, by scraping them off the pad. Then the scraped off bugs must be boiled in order produce a dye. In the more refined methods of making the dye there are a few other steps that are employed to ensure that the dye remains pure. It can take up to 70,000 bugs to create one pound of cochineal dye. After the dye was ready, my class was given pieces of colorless silk cloth which we dipped into the now prepared dye. The smell of the dye as it was prepared was horrendous, though when the process was complete, the students were left with brilliantly colored crimson cloth. It is no wonder that the Spaniards thought that this was the color of kings. Red grabs the eye, it represents power. When men on the battlefield see red, in this case the red color of blood, it makes their adrenaline spike, readying them for danger. Several studies have been undertaken that attest to the fact that red boosts our ability to do increases our motor output, producing marked increases in our performance(Eliot and Aarts).It is no wonder that it possessed this attraction to kings and their armies up until the 19th century when other methods of dying cloth bright red with synthetic means were found, but cochineal dye is still used today as a food additive and in other products. Even though humans today may have lost their fascination with the dye of the cochineal bug, the lust for red dye proved instrumental in the prickly pear’s spread across the globe. The prickly pear was viewed truly as an ally to the human race at this time. It was hailed as an incredible source of monetary profit by Spain in the monopoly it held over the dye market. Many countries invested heavily into discovering how they too could harness the power and income that the cochinael insects represented. However, that relationship eventually ended when synthetic dyes were developed, creating a whole new way to create the brilliant colors that the human race lusted over. This story is similar in some ways to the crash that the ostrich feather industry experienced in South Africa. Rob Nixon in his book Dream Birds describes the intrigue that surrounded the cultivation of feathers in the market early on. Much like Spain when closely guarded the secret to their dye, South Africa invested hugely in creating the perfect feather since “by 1911, California breeders were importing the big birds hand over fist”(Nixon 78). The needed to keep one step ahead of their competitors drove the South African feather market to new heights until 1914. Yet, unlike the discovery of synthetic dyes in the 19th century that ended much of the importance that cochinael had in the world, the feather boom in South Africa was ended not by the invention of a substitute for the fanciful plumes, but by the assassination of Archduke Franz Ferdinand on June 28, 1914. Suddenly the world was plunged into a war that changed the face of the earth and what the people of that time valued, bringing the death of the Ostrich boom. As Nixon notes “the golden gosling had fledged into a feather-duster bird”(Nixon 93). Suddenly, what had been considered easy money and an ally to the would be investor of the day, instead became just useless piles of feather. Much like the feathers, the prickly pear, once prized for the cochinael that could be cultivated from it, became just an annoying weed. Even though humanity helped prickly pear spread across the world as much as it has today, I firmly believe that had humans not existed, the prickly pear would still have found some way to surmount the oceans and spread across the planet through its incredible ability to adapt to harsh climates. The prickly pear possesses many interesting characteristics that allow it to survive better than other less adapted plant. Firstly, in order to take advantage of the short desert rains, the prickly pear can store copious amounts of water which makes up 95% of the plant. This water is stored and used to keep the plant alive even when water levels drop within the plant to a small 20%. Another interesting method these plants use to preserve water is through a special form of photosynthesis called crassulacean acid metabolism or CAM for short(Hart and Lyons). Plants have opening in their leaves called stomata, which allow the intake of carbon dioxide and the release of oxygen into the atmosphere. These usually open during the day in order to take in carbon dioxide for photosynthesis, and the plant stores energy from the sun for the process. However, this presents a problem for plants in the desert due to the moisture lost when these stomata are opened. CAM gives the plants the ability to leave their stomata closed during the day and instead store carbon dioxide in organic acids during the night, preserving tremendous amounts of water. 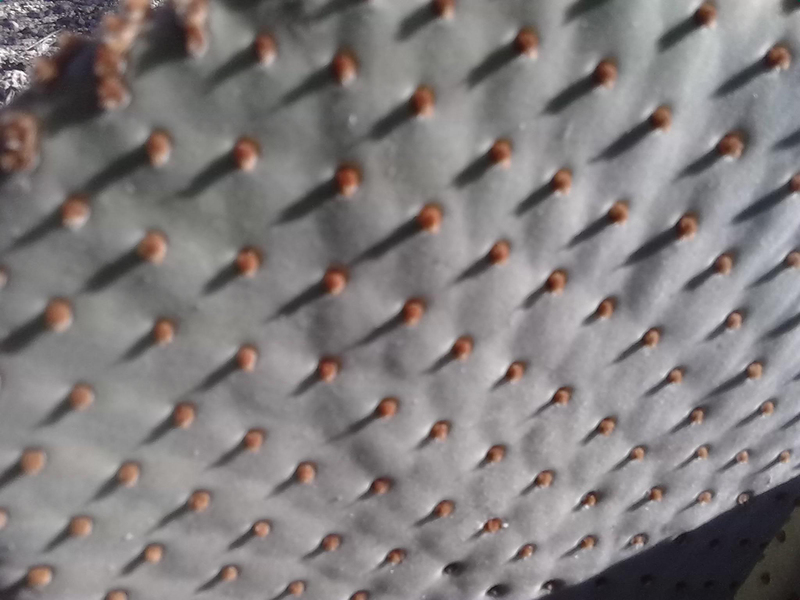 Lastly, once the cactus has reached maturity, a waxy coating can be observed on the pads that prevents excess moisture loss. 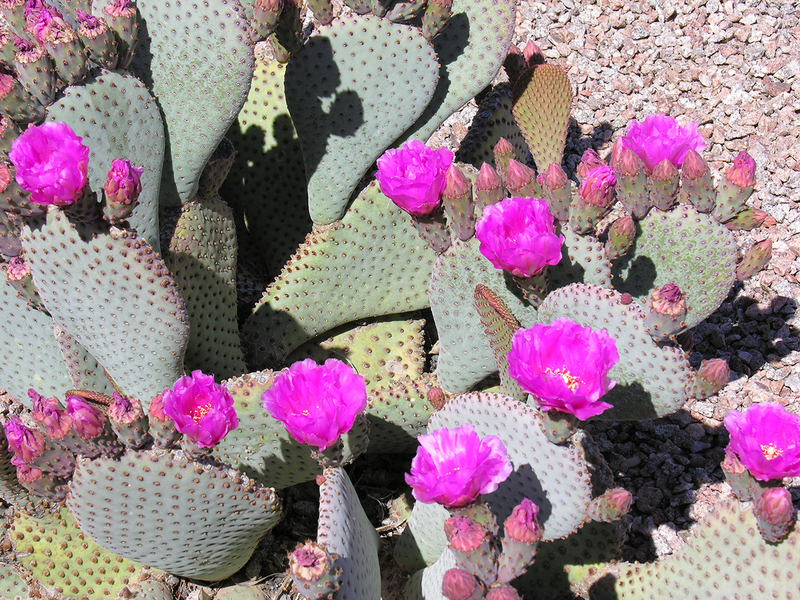 This further ensures that even if a drought occurs, the prickly pear can outlast the weather patterns. This plants seemingly limitless ability to adapt to its environment has ensured its spread across the globe and its ability to adapt to different environments other than its native home in the deserts of the Southwest. The extreme adaptability of the prickly pear has earned it both respect and a great deal of wariness throughout history. On the one hand, prickly pear is a food source for both humans and animals, in addition to providing nesting places for desert creatures. On the other hand, many consider it a weed which chokes out other native species, limits grazing for cattle, and suppresses forage production. It is in fact known as one of the most invasive species in history, for in the 18th century, when it was introduced to Australia, whose people hoped to encourage the production of dyes from the cochineal bugs which thrive on prickly pear cactus, it overtook more than 58 million acres of land by 1920(The State of Queensland, n.p.). It left what had once been thriving farms and homes completely engulfed by impenetrable walls of prickly pear. Methods were employed to try to remove the prickly pears, however the chemicals required to kill them were too expensive and toxic, and simply cutting up prickly pear with machinery only created more plants than they had started with. So began the war to cull the ever advancing forest of prickly pear cactus, which continued to advance at a rate of 2.4 million acres per year. It took until 1932 for scientists to find an effective method of killing the cacti with the use of insects that destroyed the prickly pear stems by eating them. Finally the “Green Hell”(The State of Queensland, n.p.) as some had called it came to end, yet overall it left its mark upon the world. The prickly pear is an incredibly well adapted species that is often overlooked today as being simply ordinary by those who wander by. In reality, the Prickly pear is in fact far more diverse than many realize and is perhaps one of the most invasive species in history due to humans complete inability to be able to contain it in any effective manner, proving that it had outsmarted even humans for the longest time. In addition to being incredibly invasive in some cases, the prickly pear has also been relied upon by native peoples throughout history for food, and has many followers in the Southwest that attest to its healthiness and deliciousness. I have tried the fruit on a few occasion, though never straight from the prickly pear plant, however eating the pads never really occurred to me as an actual source of food. 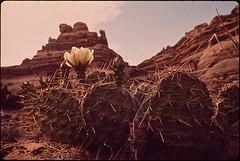 The fruit is fibrous and sweet, and is eaten by both animals and humans(“Prickly pear as Resource”, n.p.). Though it has been documented by ranchers that extensive eating of prickly pear can cause problems in livestock due to the lack of protein and the high fiber content, it was still considered a staple by many traditional cattle ranchers in times of drought, who would remove the spines from the plant by burning them off and then feed the cattle the moisture rich pads. The fruits are the part that is most prized in cuisine. It is sweet and full of seeds, which possess a hardy shell that protects them from both digestive enzymes and the heat, this ensures that the plant is able to reproduce in a great variety of climates(Hart and Lyons). 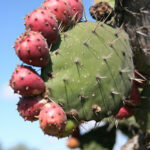 Perhaps it would be beneficial to increase the eating of prickly pear as a food source for people. It happens to be very healthy and full of energy, the pads themselves taste a bit like green beans when cooked. Some studies suggest that diets containing prickly pear may even help to regulate blood sugar in people with diabetes and high cholesterol(Knishinsky), yet it is the chefs that use prickly pear in their recipes that have truly gone above and beyond with this plant. Recipes range from the traditional, one can simply saute the prickly pear pads one can find in many local grocery stores under the name Nopales, to the complex fare that one might expect at a classy dinner party. You do not even have to buy Prickly pears from a store, since anyone can grow these ingredients within their own garden if they wish to attempt to remove the spines themselves. 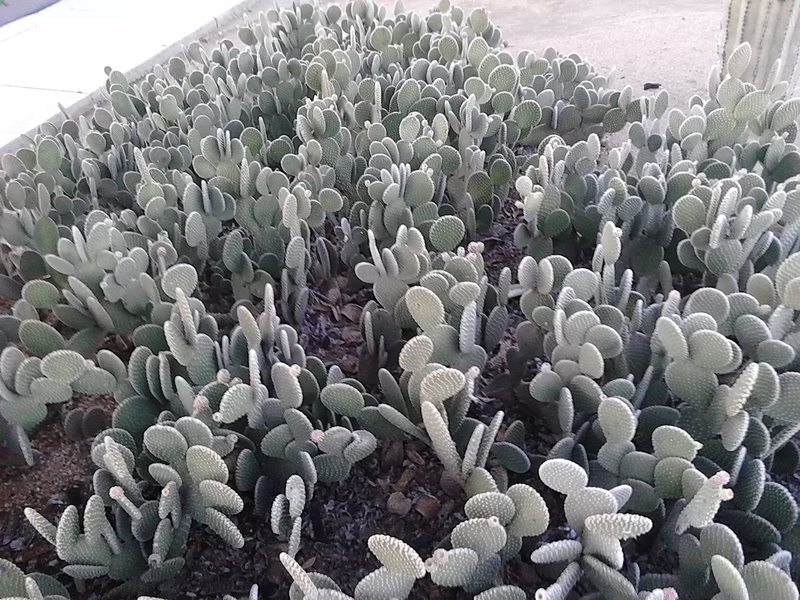 They aren’t difficult to grow, only requiring a cutting from a healthy prickly pear plant to be planted in a pot or in the ground and watered regularly till it is established. 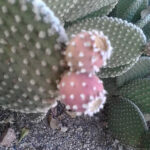 The spines must carefully be removed with the use of a knife and usually sturdy gloves, yet one can also find spineless varieties of prickly pears around. The creation of a spineless variety of prickly pear that might be distributed through the supermarkets was a whole other question. Luther Burbank, the same person that Burbank California is named after, described his efforts to create a spineless prickly pear as “in some respects the most arduous and soul-testing experience that I have every undergone”(Burbank 100). Burbank thought that the prickly pear was the answer to limitless food for people across the world, since prickly pears in the wild grow quickly and are incredibly nutritious. There was just one problem, the spines made it difficult to mass produce prickly pear. Not everyone is willing to cut off the spines and risk the irritation they can cause. Therefore Burbank set off to cross breed prickly pear’s until he created a spineless variety. He spent years trying to achieve the perfect prickly pear, and eventually he did create a few varieties that seemed to do just the trick.. Yet creating a spineless variety had some setbacks that virtually derailed Burbank’s project, leading to some even calling him a con artist. The prickly pear species he created took much longer to mature than most wild varieties, in addition to requiring more delicate growing conditions. “Any way you looked at it, the Burbank cactus was a failure as a world-changing plant; it was just another Burbank garden novelty”(“The Prickly Luther Burbank”, n.p.). 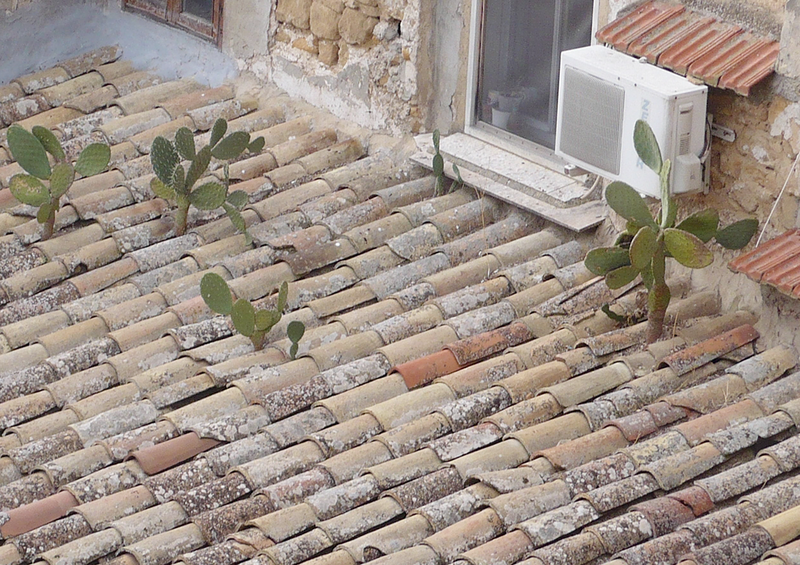 Burbank took away the cacti’s defenses to the world around it and tried to adapt it with disastrous consequences. 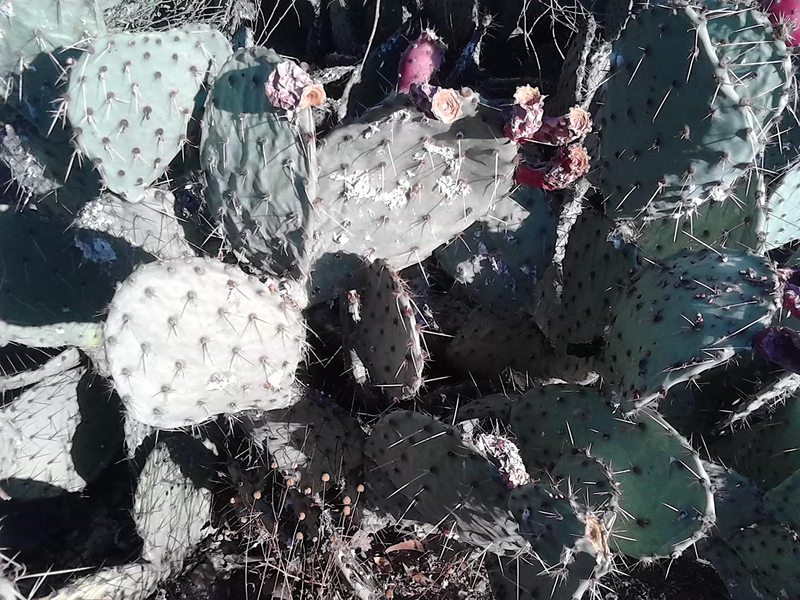 Eventually, the prickly pear fever that gripped the world once again died away, leaving Burbank I would imagine, cursing the countless hours he spent being pricked by the spines of the prickly pear. There are several benefits inherent in the use of prickly pear that people have drawn attention to over the years. One is a substance that Burbank found that could be derived from it which wards off mosquitoes. 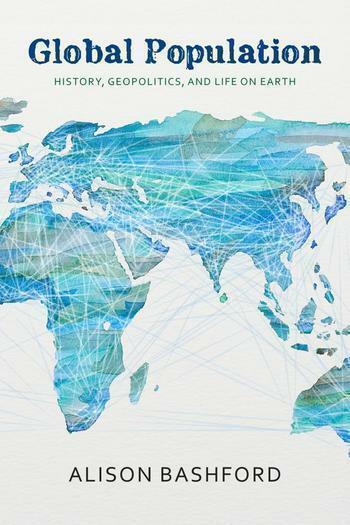 It would be interesting to see if that would be viable in less developed countries that suffer from malaria, perhaps cutting down on the toxic use of chemicals to keep mosquito populations down. 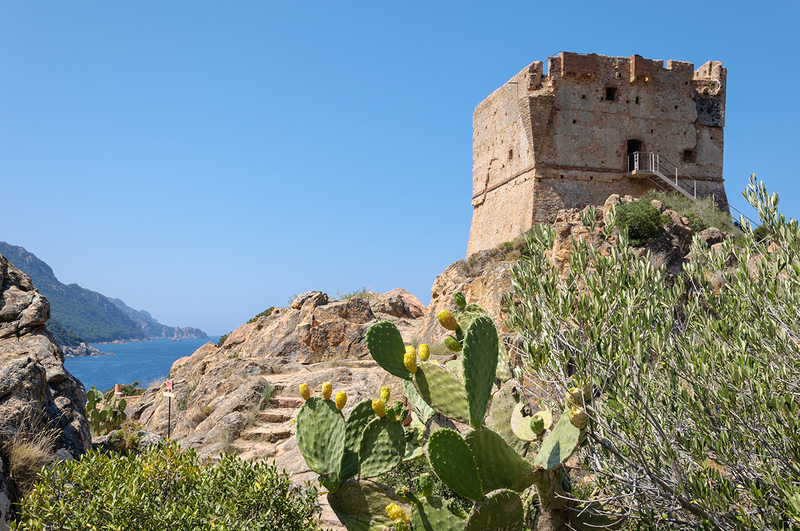 Today one of the ingredients that can be some in some insect repellents is derived from prickly pear cacti. Yet, who would have thought that there would be so much contention over a plant that many considered a weed? Burbank probably made the equivalent at the time of millions off of his prickly pear species, even if his plant was a disgrace to some extent. What other plant has caused such upheavals and still quietly continued its march across the globe? Given enough time, it wouldn’t surprise me at all to see the prickly pear in every country of the world, different varieties of course, but all with there ancestry in just a few strange plants in the America’s. If humanity were to die out tomorrow, prickly pear would still continue its inexorable march across the globe, without us or not. 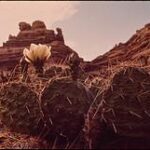 Do humans want a hellish land only populated by cacti? Most definitely not, but humans should feel inspired by the prickly pears desire to spread across the globe just as humans have been doing themselves for centuries, yet the fact is that at the rate we are going, humans are far more likely to disappear than cacti at this point. Humans are too busy not adapting to our environment, and instead we are making it more difficult for us to live. We aren’t learning to live alongside the ecosystem, we are sitting still. 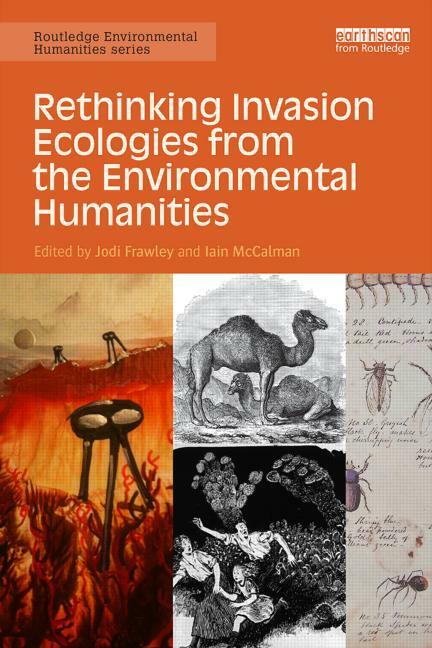 Like the cochineal which require the prickly pear to survive, humans seem to be actively working to kill the thing which sustains us. 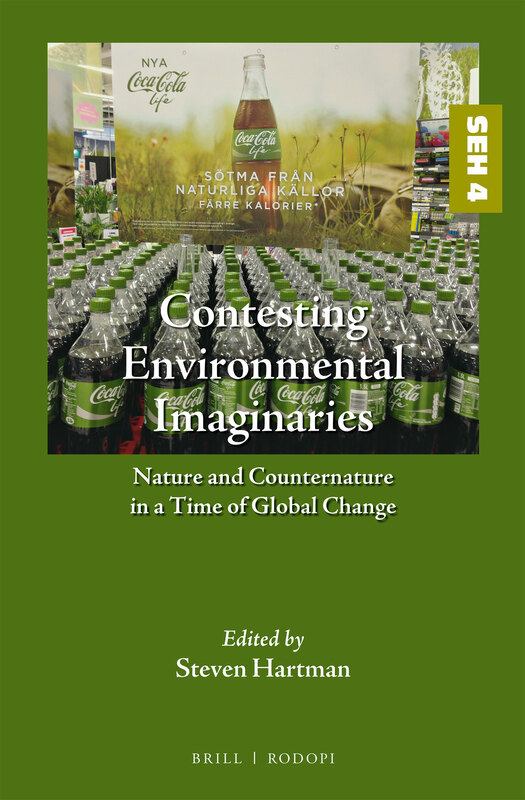 We say that plants and animals are lesser than the human race because we possess logic and reason, yet do we see plants and animals actively trying to destroy the resources that allow them to survive? That is a resounding no. The prickly pear has been both considered an enemy and an ally since its discovery by the native people’s of the America’s hundreds of years ago. It was a staple to native diets, and the source of the cochinael dye that took center stage in Spain. 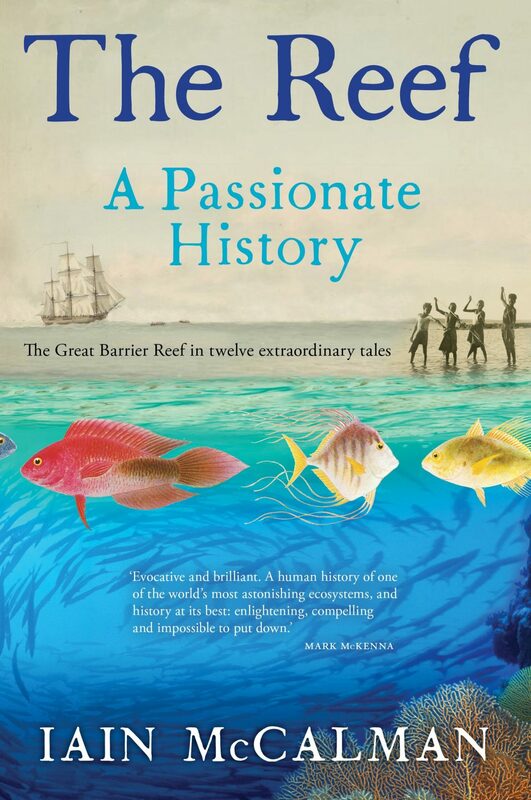 It was hailed as a food source in times of drought, and decried as a invasive species in Australia. Now it is for the most part forgotten, a strange plant whose spines can cause incredible pain, even engendering a lifetime of avoidance as it did when I was a small child. Yet the important question here is what future does the prickly pear have, and how does it relate to the future of the human race? Elizabeth Kolbert offers up these lines from her book The Sixth Extinction as a potential answer to this. 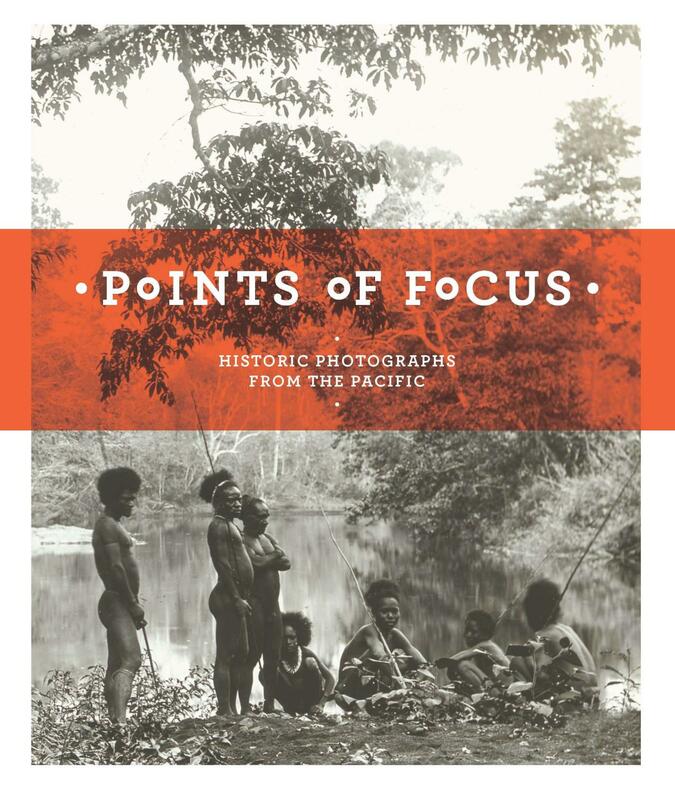 Humanities survival is dubious if we continue in the same direction that we are, yet less dubious is the survival of the prickly pear when examined throughout history and today. While humanity may be waiting for the next catastrophe to come upon us; the prickly pear is busy ensuring that it will live on without humanity, marching across the globe, prepared to live forever. Burbank, Luther. How Plants Are Trained to Work for Man. New York: P.F. Collier, 1921. Print. 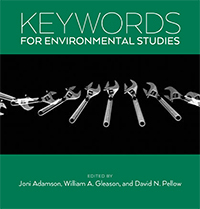 Donne, John, and E. K. Chambers. Poems. London: G. Routledge, 1896. Print. Eliot, T. S.. “The Hollow Men.” Collected poems, 1909-1962. Orlando: Harcourt, Inc., 1991. 77- 82. Print. “Genus Opuntia (incl. Cylindropuntia, Grusonia, and Corynopuntia).” Genus Opuntia (incl. Cylindropuntia, Grusonia, and Corynopuntia). Arizona-Sonora Desert Museum, n.d. Web. 03 Sept. 2014. Hart, Charles R., and Robert K. Lyons. “Pricklypear Biology and Management.” Pricklypear Biology and Management. AgriLife Communications, The Texas A&M System, Aug. 2010. Web. 1 Sept. 2014. Knishinsky, Ran. 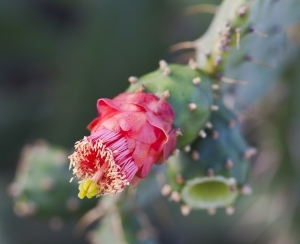 Prickly pear cactus medicine: treatments for diabetes, cholesterol, and the immune system. Rochester, Vt.: Healing Arts Press, 2004. Print. Núñez Cabeza De Vaca, Alvar, 16th cent. The Journey of Alvar Nuñez Cabeza De Vaca And His Companions From Florida to the Pacific, 1528-1536. New York: Allerton book co., 1922. “Pricklypear as Resource.” Pricklypear as Resource. NAU, n.d. Web. 03 Sept. 2014. “Prickly Pear Cactus.” DesertUSA. DesertUSA and Digital West Media, Inc., 1996. Web. 03 Sept. 2014.